I grew up in western Maine and spent my early years roaming the forests and wetlands and establishing a deep and lasting connection with the natural world. My passion and love for all things wild led me to earn a Bachelor of Environmental Science degree in Wildlife, with a minor in Art, from Unity College in Maine, and I’ve spent my life pursuing a deeper understanding of nature and wildlife through the process of creating art. Painting, for me, is a celebration and an exploration. The intention of my work is to identify and express layers of interest by studying and connecting with my subject. I find equal importance in light and line as I do in the poetry of deep understanding. Portrait art is ideally suited to this intent due to its characteristics of form combined with personality and character. 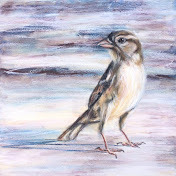 My current work is a series of portraits of wild birds. I find birds especially intriguing and interesting to paint not only for their variety and glorious colors, but also for the challenge of painting creatures that are so different from us, and from mammals in general. Beaks and talons seem so foreign, yet when one really peers into the expression of an individual bird, the ability to find common ground and relatedness can seem especially striking. I paint mostly with oils, watercolors, and oil pastels. Oil pastels are probably my favorite medium, because I like to paint with my fingers and the lipstick-like properties are so fun to work with. Smearing and blending and scraping all come very intuitively to me. Regardless of the medium, my paintings tend to be loosely realistic, with explorations into the abstract qualities of both the subject and the background, along with the deeper and more metaphysical aspects of spirit and emotion. I find that elements of today’s society are pulling many of us further and further from the natural world. Even those of us in rural areas are becoming seemingly more blind to our surroundings, and less likely to spend time in fields and woods or studying nature. I fear that this blindness will lead to less respect for and less focus on the needs of not only the wild animals and plants who live around us, but for fragile ecosystems in general. I see nature art as an opportunity to not only share the beauty and wonder of the outdoors and its inhabitants with my fellow nature lovers, but also with those who may have forgotten, or have never known, how extraordinary and essential our connections with the natural world truly are for us all.